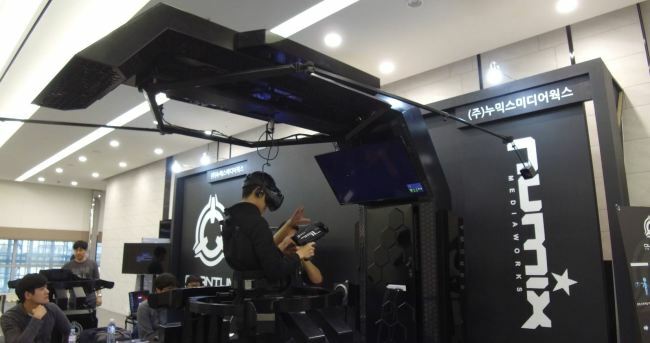 Numix Media Works’ Quantum VR Treadmill is a virtual reality first person shooter game that gives a realistic game experience of walking through a jungle, in the space and through a maze of monsters. The treadmill was unveiled for the first time at the NEXT Content Conference at Coex in Samseong-dong, southern Seoul on Monday and Tuesday. 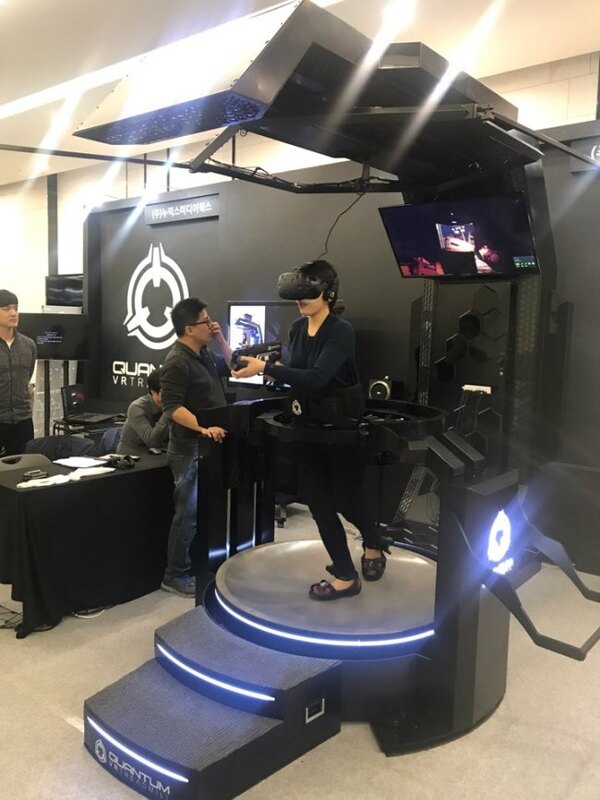 Han Sung-bok, the Chief Technology Officer at Numix, said that the Quantum Treadmill differentiates itself from the other VR amusements that are already out in the market, by being a 4-D immersive game with gun consoles. “Majority of the released VR rides are experiential. They let the riders sit tucked in and watch the virtual reality world happen, without the players engaging in it,” Han said. Han says the Quantum Treadmill is the next generation of VR hardware that expands a standstill deck to a 360-degree revolvable ground that can be treaded endlessly. 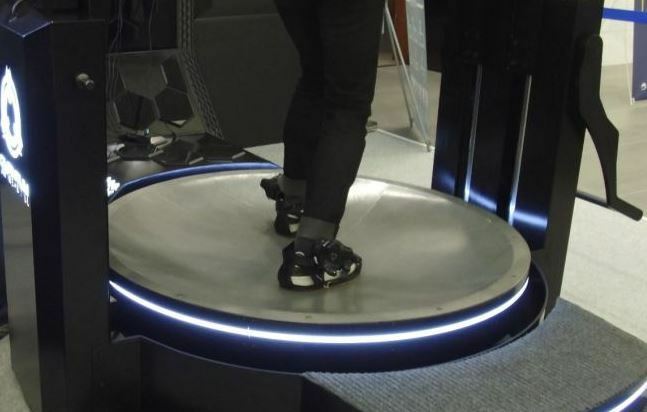 Once the player wears the body band and the shoes and puts on the VR goggle, the treadmill detects the sensors attached to the devices and allows the player to walk in a sliding motion. The true four dimensional experience comes from the concave disk that the players stand on, and the air compressors that gush out wind. The disk balances the player’s movement, sometimes tilting upwards or shaking to create the feeling of walking uphill and an uneasy encounter with a bloodcurdling monster. The air compressors, placed above the players head, blow out wind when monsters attack, breathing life in to the game world. Numix currently has three games that can be played on the treadmill. The game company, established in 2011, began to focus on the VR market from 2014. After the NCC, Numix will take the Quantum VR Treadmill to G-Star, an annual global game exhibition at Bexco, Busan, which will run from Nov. 16 to 19. The two-day conference discussing the future of new media contents in the age of the ‘fourth industrial revolution,’ NCC is hosted by the Ministry of Culture, Sports and Tourism and supervised by the Korea Creative Content Agency.